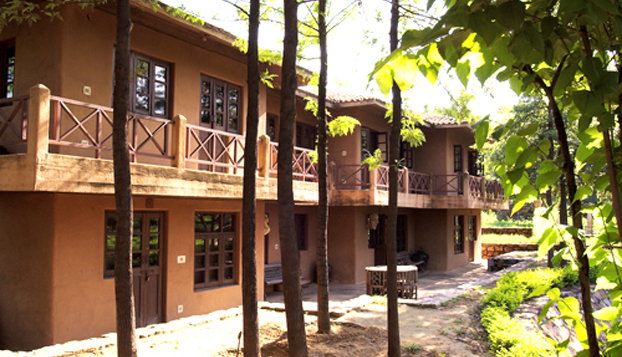 Sanskriti Kendra offers boarding, lodging and workshop/seminar facilities to artists, writers and the non-profits. 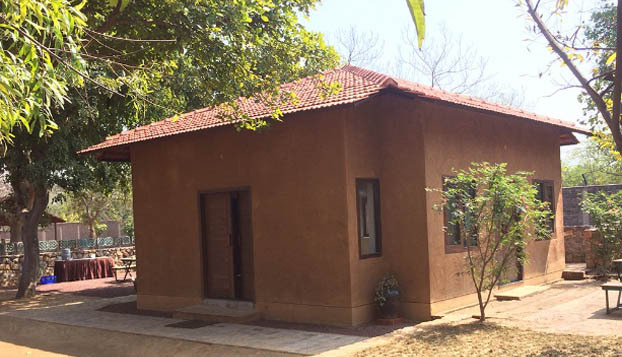 During your stay at Sanskriti you will be housed in the studio buildings, giving you full access to your workshop and studio space at all times, catering for whatever work regime you set for yourself. All eight studios are double-storeyed apartments. A staircase leads up from the studio to the mezzanine to a comfortable bedroom and bathroom. All studios open into a courtyard. • All studios are equipped with worktables, work counters, easels, storage space and kitchenettes. • All studios have attached bathrooms with clean linen and towels. • Laundry services are available against payment. Dry cleaning can be arranged if requested. 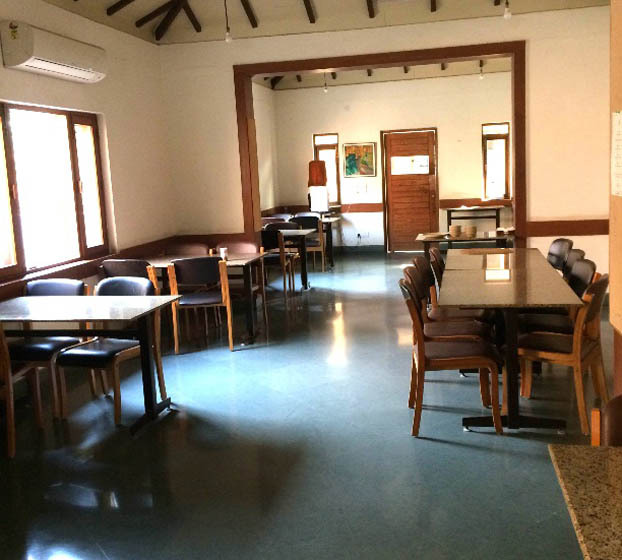 • The tariff includes the rental, meals and use of all facilities, including participation in all cultural, artistic events and activities at nominal cost that take place at the Kendra. These are four ground floor general studios. All open into a courtyard. The dormitories have a boarding capacity of 4 to 5 adults in each dorm. These are ideal for NGOs to house their residential participants during their workshops. The dormitories can also be used for group residencies of students/artists. Sanskriti has two gallery spaces, which can be used for various exhibitions. 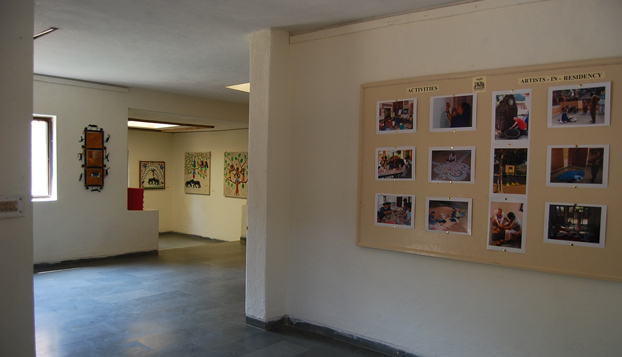 Sanskriti Kendra has a highly specialized reference library housing around 2000 books on art, culture, museums, Indian traditions of textiles, handicrafts and Indian terracottas, etc. Visitors, researchers, artists and students are welcome to use the material. 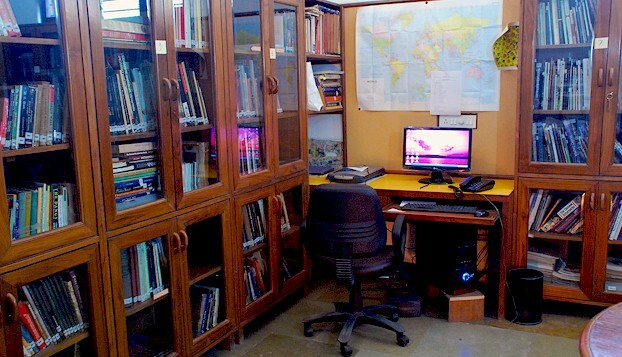 A part of the library can also be used as a meeting room for small groups and NGOs. The multi-purpose hall and the art gallery are so designed that both spaces can be turned into one unified large space or used simultaneously as two separate spatial units, depending on the requirement of a particular event hosted there. The multi-purpose hall is equipped with state-of-the-art audio-visual facilities and can lend itself well to workshops, conferences, meetings, lectures, film-shows, etc. The general as well as the specialized lighting system and fixtures make the space an ideal art gallery. 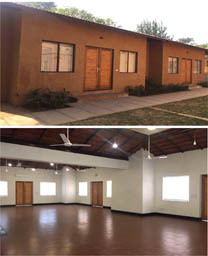 The Multi-Purpose Hall has a seating capacity of up to 100 people. 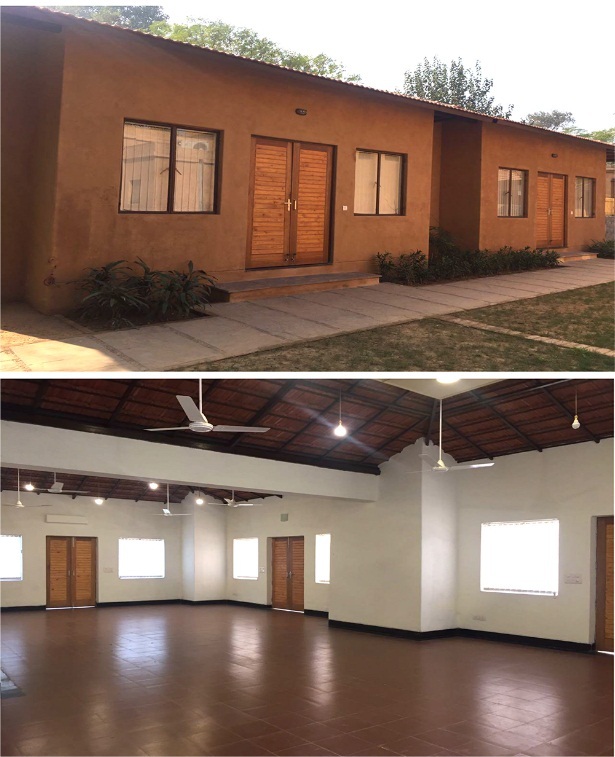 Located at the far end of the campus, this square dimensional space is ideal for quiet workshops and meetings for a seating capacity of 20 to 25 people. The most recent edition to the campus is this rectangular Hall located behind the dormitories with a seating capacity of around 30 people. Non-profits can avail this facility for their workshops, while art and crafts workshops for children and adults can also be conveniently organized in this space. It accommodates approximately 200-250 audiences. The theatre has a large circular stage with a beautiful backdrop of an 18th century carved stone Jharoka. It is suitable for group or solo dance/music performances as well as skits and children’s plays. Eminent artists such as Madhavi Mudgal, Malavika Sarukkai, Kumar Mardur, Lalith Rao etc. 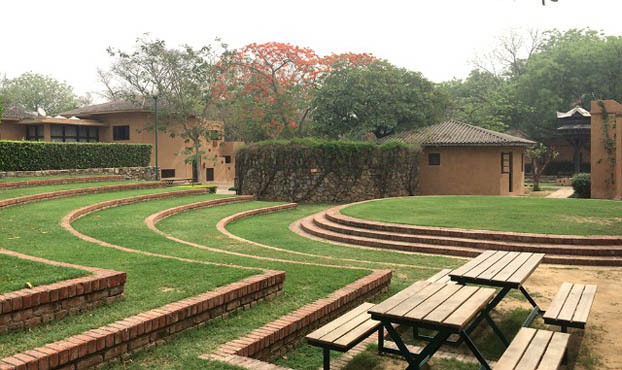 have performed here.Theatre personalities like Feisal Alkazi have directed plays for children. Dimensions : 605 sq ft. 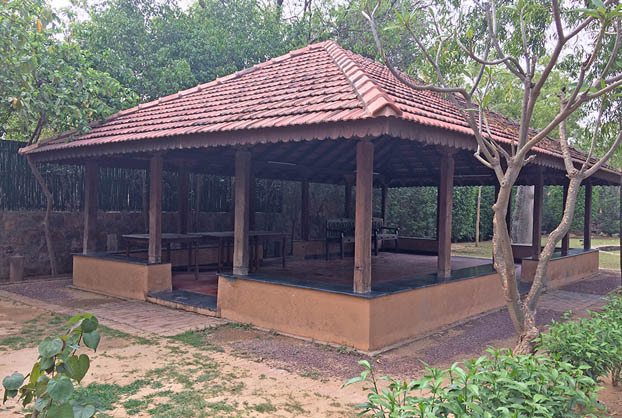 This is a rectangular raised platform, covered from the roof and open on the sides, ideal during the winters for Yoga sessions, mindfulness workshops, arts & crafts sessions, performing arts workshops, etc. Internet facilities are available on the campus through wireless dongles. A First Aid kit is available in the office. In case of an emergency, you can request for medical help to be summoned. Residents must pay for their own medical bills. Residents will be responsible for obtaining their own health / medical, accident or other insurance that may be necessary. Local bus or the Metro provides a direct link to the city. Our nearest metro station is Arjangarh metro station on the yellow line. Taxi: If required residents may ask for transport to Delhi through the local taxi stand or book a cab through ola/uber. Airport pick-up can be arranged on prior notice and will be charged on actuals. Kindly note that Sanskriti will not reimburse any travel expenses including those incurred on local travel.